We are living in the time of digitization where internet has become a crucial part of our daily lives. There passes no day without the requirement of internet for various information and needs. It is definitely a necessary medium to keep you updated and well informed on various happenings of our surroundings. Acquiring new information online through e-magazines and news applications has become an ongoing trend. Online magazine is an intriguing concept that makes available the contents of a magazine that can be subscribed by the consumers without having to travel anywhere and you can enjoy reading the magazine on just a click on phone or laptop. Before you go to magazine subscription at best price online, look out for Free version Offers of the suitable magazines of your interest. Try and get on their mailing list, so that whenever the free free/trial subscription offer comes up you are one of the people that are notified first. Even if the offer is just for a month or two, do subscribe as it may give you the best output of their contents and whether you would like to spend money for further subscription in the future. 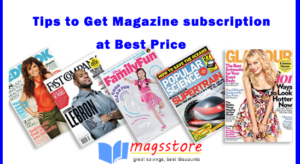 Avail the best price discount offers you come across- rather than ignoring the magazine subscription at bestprice discount offers, look carefully through the magazine websites that may have something to offer and save your hard earned money. Few websites like Amazon, magsstore etc. make some amazing offers. Do a little research and get to know more such websites and keep a regular check on them and you might get your magazine subscription at best price. If you and your friends too have similar interests in magazine so you can together get a subscription or even in a group. It will get you access to the global contents without burning a hole in your pocket. So, before getting any magazine subscription just discuss with your friends or colleagues. Or another smart idea is to swap/exchange subscribed magazines with each other. This will cost you cheaper and give more exposure to the variety of content of different specialized editions of the digital magazines. Subscribe magazine for longer period of time (i.e. year plans) rather than buying the subscription frequently after few months. It offers other incentives of subscription and saves a lot of money in long term that can be utilized for multiple other subscriptions of your interest. If you are regular consumer of a particular online magazine then you must not forget to grab the opportunity to collect reward points that go into your e-wallet for being a loyal and long term consumer. This helps both the provider of the e-magazine as well as the media consumer to remain engaged and motivated read more of what is offered to them. Do not miss out on any “buy one get one deals” for cheap magazine subscription and take active participation in the consumer interaction offered by the online magazine provider so that you are the high rated subscriber and be the first to enjoy the best of their ceremonial offers. These are some of the simple yet in some ways quirky tips to help you to get discount magazine subscription online at best price without going through the glut of information on the internet. Do keep these steps in your mind before subscribing to an online magazine and become a smarter digital native.